Mr. Sam Singh launched his career in the Michigan philanthropic world with his first job as a Youth Engaged in Service ambassador. He served as executive director of the Michigan Nonprofit Association, and in that role helped to integrate Campus Compact and Volunteer Centers of Michigan into the larger organization. When it made sense to merge ConnectMichigan Alliance with the Michigan Nonprofit Association, he worked closely with Kyle Caldwell to integrate the two organizations and complete a smooth transition. Mr. Singh currently serves as a representative from the Lansing area to the Michigan House of Representatives and brings a government perspective to his reflections, as well as his years of leadership and service. Mr. Sam Singh talks about his career in philanthropy. Mr. Sam Singh talks about the importance of collaboration in philanthropic work. Mr. Sam Singh talks about the Michigan Nonprofit Association's stance on public policy. Mr. Sam Singh talks about the strength of Michigan's nonprofit infrastructure and how this network was replicated in other parts of the country. Mr. Sam Singh talks about engaging in public policy in the philanthropic sector. Mr. Sam Singh talks about the history and development of the ConnectMichigan Alliance (CMA). Mr. Sam Singh talks about the importance of collaborative partnerships among the private, public, and philanthropic sectors of society. Mr. Sam Singh talks about the importance of allowing local leaders to implement strategies best suited for their local communities. Mr. Sam Singh talks about the importance of backing up public policy initiatives with well-researched data. 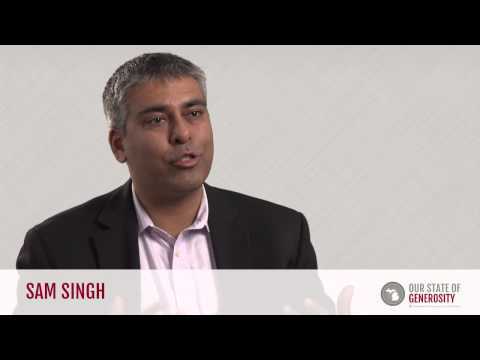 Mr. Sam Singh provides a perspective on international philanthropy from his travels. Mr. Sam Singh talks about the national branch of Campus Compact and the mission of organizations like the Campus Opportunity Outreach League (COOL). Mr. Sam Singh talks about how the strong foundation of staff at MNA allowed him and other board members to focus on public policy. Mr. Sam Singh talks about the importance of natural leadership transition in organizations and the merger between CMA and MNA. Mr. Sam Singh talks about how MNA created frameworks and rules for engaging in public policy. Mr. Sam Singh talks about the balance between mission and public policy initiatives in philanthropic infrastructure. Mr. Sam Singh talks about how the ConnectMichigan Alliance (CMA) emerged from a collaboration of the public, private, and philanthropic sectors for the betterment of the state. Mr. Sam Singh graduated from Michigan State University in 1994 with a Bachelor of Arts degree. Mr. Singh’s parents emigrated from India, where their families had been involved in local politics, to the United States in the 1960s. They often discussed the issues facing their community, state, and country with Mr. Singh and his brother, and instilled the idea of “giving back to the country that provided you this opportunity” as immigrants. Mr. Singh initially attended Michigan State University with the intention of going to law school, however in his interview with Dr. Kathy Agard, he identifies two experiences that caused him to change his focus and instead enter the nonprofit sector. The first of these experiences occurred after he became involved in a program called Into the Streets, which was started by a larger organization called the Campus Opportunity Outreach League (COOL) and was funded by the W. K. Kellogg Foundation. His involvement with Into the Streets brought Mr. Singh to Camp Miniwanca to talk about transforming service at a Michigan Community Foundations’ Youth Project (MCFYP) youth leadership camp. This camp introduced him to the work of the Council of Michigan Foundations and MCFYP, and demonstrated to him how philanthropy can be institutionalized and systematic. This newfound interest in the nonprofit sector led Mr. Singh to become a Youth Engaged in Service (YES) ambassador with the Points of Light Foundation in 1993. According to Campus Compact, the YES program “places community-minded young people between the ages of 18–25 with statewide partner organizations for one year to provide technical assistance, training, advocacy, and program development around youth service, service learning, and youth leadership (1).” The YES program placed Mr. Singh at the Michigan Community Service Commission, where he helped to develop and implement the first Governor’s Service Awards, as well as assisted in implementing AmeriCorps during its first year in Michigan alongside Mr. Kyle Caldwell who was then serving as a governor’s management intern. After finishing his yearlong commitment to the YES program at MCSC, Mr. Singh was asked to become the executive director of Volunteer Centers of Michigan, which at the time was housed at the Michigan Nonprofit Forum (which would later become the Michigan Nonprofit Association). When Mr. David Egner left the position of president and CEO at the Michigan Nonprofit Association (MNA) in 1997, Mr. Singh was asked to take the position — he was only 26 years old. Mr. Singh served as president and CEO of MNA for ten years, and oversaw many significant changes to the organization. Under his leadership, the membership of MNA increased, from 464 member organizations in May of 1998 to over 1,000 by 2007. Mr. Singh also helped to build the public policy advocacy capacity of Michigan’s nonprofit sector by partnering with the Council of Michigan Foundations to create the Michigan Public Policy Initiative (MPPI). MPPI was created to educate newly elected legislators on the nonprofit sector, as well as to educate nonprofits on how to become engaged effectively in public policy. One major change that occurred during Mr. Singh’s tenure was the creation of the ConnectMichigan Alliance (CMA), and its later merger into MNA. This movement was in response to a growing concern that Michigan’s nonprofit sector would struggle without a robust network of volunteers and an infrastructure to manage it. Many key leaders realized that such a network’s success would be greatly dependent on consistent public and private funding, which was uncertain at the time. This uncertainty was compounded by the impending conclusion of Gov. John Engler’s administration, and so a campaign was started to create a permanent endowment to support and promote volunteerism. Gov. Engler championed the creation of a $10 million, 1-for-1 challenge grant. After the successful completion of the challenge grant, it was decided that a separate infrastructure organization should exist with a focus on volunteerism. The ConnectMichigan Alliance (CMA) was formed in 2001 with Dr. John Lore at its helm. Upon its creation, CMA had $20 million of endowed public and private funds, and housed many initiatives that focused on supporting volunteerism, including Volunteer Centers of Michigan, Michigan Campus Compact, and America’s Promise, which were previously supported by MNA. Kyle Caldwell succeeded Dr. Lore as executive director of CMA in 2004. As both MNA and CMA grew and developed, it became clear that the organizations were filling similar roles in the sector. This sparked a discussion of a possible merger of the two organizations, which was supported by both Kyle Caldwell and Mr. Singh. When the merger took place in 2007, both leaders backed giving MNA’s board the ability to choose the new president and CEO of the newly strengthened MNA. At this point, Mr. Singh was approaching his tenth year of leadership at MNA and expressed a willingness to step away from the organization. Thus, Kyle Caldwell was asked by MNA’s board to fill the role. This departure from MNA allowed Mr. Singh to pursue a lifelong dream of traveling the world, and he visited all seven continents and over 45 countries during a 16-month period. Mr. Singh used this trip not only to expand his cultural horizons, but also to become involved with nonprofits across the globe to see how they operated differently than those in Michigan, and to gain a greater understanding of the issues the international community faces. After returning to Michigan during the summer of 2009, Mr. Singh joined the New Economy Initiative, headed by Mr. Dave Egner, as a senior consultant. In this position, Mr. Singh used his public policy experience in helping to create a policy framework and to build collaboration between the government and the nonprofit sector in the revitalization of Detroit. Outside of Mr. Singh’s career in the nonprofit sector, he has held a variety of positions in state government. He was elected to the city council of East Lansing in 1995 (at the age of 24), and remained a councilman until 2005, when he was elected mayor of East Lansing. In 2012, Mr. Singh was elected as a representative in the Michigan House of Representatives for the Lansing area (District 69), where he continues to serve today. This mixture of nonprofit and government experience puts Mr. Singh in an extraordinary position to facilitate collaboration between the sectors, and gives him an exceptional perspective from which to assess the history of Michigan’s nonprofit sector. 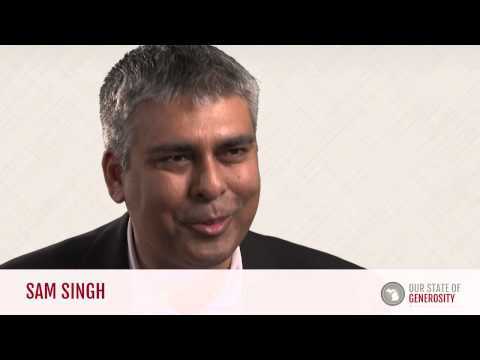 Mr. Singh was interviewed regarding his insights and experiences in working with Michigan’s philanthropic community and the Our State of Generosity (OSoG) partners. The following are selected quotations from his interview specifically related to the five organizing themes of the OSoG project.